Hi ladies, recently I started using a couple of products from Reflections Organics I got from its launch event, and decided to add them into my everyday makeup routine. It’s been a few months, and I still find myself reaching out for them. So a review is definitely needed on the blog! Besides that, I also made a video to share how I do my makeup. 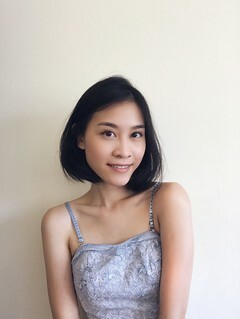 Very basic, no frills, light makeup that can survive the humid weather in Singapore. Pros: Love, love, love this product. Although the Camouflage Cream comes in a pot, the formula is towards creamy than cakey. Very lightweight, blend-able, and easy to layer on if you need more coverage. It has worked very well for my dark eye circles, and especially blemishes. There are 5 shade available, and the Picturesque is the darkest (still pretty light I think!)! I’ve gotten pretty tanned and this shade suits me just fine after I have brightened up my skin tone with CC cream. The combination gives a healthy and natural glow to my visage. At first I was worried about it melting away, but after setting it with loose powder, the concealer cream does not budge that much. Pros: The staying-power of the Liquid Liner is INSANE. It claims to be 100% smudge-proof so I did an experiment. I drew 3 strokes of varying thickness on my hand and that’s what still left after 3 days. 3 DAYS of normal hand-washing, showering, etc did not even make most of the liner budge. But of course, it came off very easily once I used a makeup remover. I am super impressed with its long-wearibility, and it totally struck down the notion that organic makeup is not long-lasting. Cons: Unfortunately I was quite disappointed with the applicator brush. The Liquid Liner has a rather thick brush, which isn’t exactly a brush either, but a hard stick. It felt like I was applying with a wooden pen nib, and it was also quite difficult to control the thickness of the stroke. Pros: Gorgeous colour, super moisturizing, and does not dry out the lips AT ALL. I’ve had lip sticks cracking out my lips, but my lips only feel softer after applying the Lip Butter. It doesn’t have an oily or sticky feel. It is also long-lasting, and leaves a gentle colour stain, which I like. Although you see some shimmer in the colour upon application, I believe that’s from the organic butters (mango, avocado, cocoa) that are absorbed into the lips quickly, leaving a more matte finish. Reflections Organics is a Singapore-founded cruelty-free organic and mineral makeup line. Each product is formulated with up to 90% USDA certified organic ingredients, with no harmful chemicals and synthetic fragrances. The line boasts a high-performing pigmented makeup with long-lasting power, while providing wholesome natural nourishment for skin. PROMO CODE -> Use exclusive code “ROZoe17“ for 10% off all products! Applicable for all products and valid from now till March 2017.